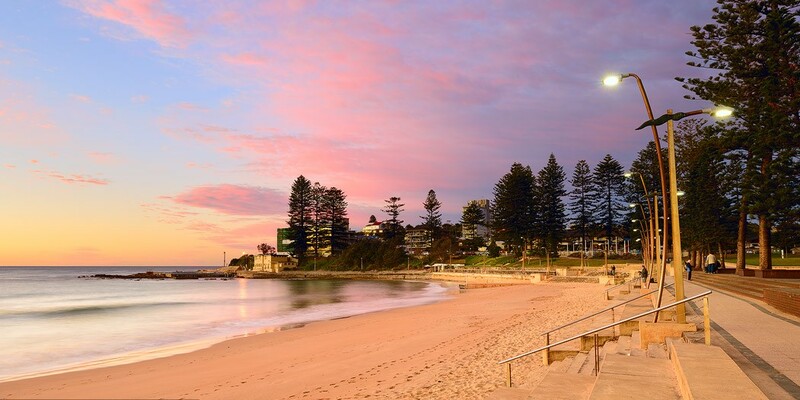 Dee Why is a suburb of Northern Sydney in the heart of the Northern Beaches. It is located 18 kilometres from Sydney’s CBD. The local government of Dee Why is Warringah Council. There has been much speculation over the origin of the name Dee Why, one of the earliest references is a pencil note in the field book of surveyor James Meehan. From 1840 the name was recorded as just one word but during the 1950’s it was split into two words. The size of Dee Why is approximately 3 km². There are 5 parks in the area which take up almost 17% of the area. Dee Why beach runs for approx 1.2 kms to Long Reef Headland. Dee Why has a number of schools and child care facilities including Brigadoon Cottage Kindergarten, Kindy Time, Redman House, Warringah Family Day Care, Fisher Road Special School, Dee Why Public School, St Lukes Grammer School, St Kevins Primary School. To the north there are sand dunes which separate the beach from the Dee Why Lagoon. At the southern end is the Dee Why Reserve which is very popular with its picnic areas and two playgrounds and there are also several ocean pools just below the cliffs. The Strand at Dee Why Beach has an abundance of coffee shops and restaurants. The Strand is a popular spot for the locals to dine out and enjoy the ocean views whilst eating. With a wide selection of cuisines ranging from Japanese, Italian, Seafood, Modern Australian, Indian and seafood just to name a few. Dee Why also has a large number of cafes and restaurants throughout the suburb. Dee Why has over 200 specialist shops on offer, including larger supermarkets such as Coles and Woolworths. Dee Why is only a short distance from Warringah Mall. Dee Why RSL is located on Pittwater Road and has been part of the community for over 60 years. Dee Why RSL club offers a place for friends to gather together, enjoy good food and entertainment. The main commercial area of Dee Why is on either side of Pittwater Road, the main road of the Northern Beaches, there are a number of roads off Pittwater Road all leading to the beach. Dee Why boasts a lot of units and is popular for the first home buyer to get into the market in the Northern Beaches. Developments are ripe in Dee Why with Dee Why Grand the newest one with apartments on top of and an abundance of shops underneath. Dee Why Surf Life Saving came about in 1912 and in 1913 the first club house was built. Today it has over 600 members and patrols one of Australia’s most popular surf spots and is soon to celebrate their centenary. There is a bowling club on Fisher Road, Long Reef Golf Course is nearby, there are coastal walks from Dee Why, and a Dee Why Fitness First Centre on the corner of Pittwater Road and Harbord Road. Dee Why also has sporting clubs for soccer, Rugby League, tennis, ten pin bowling, netball and volleyball. © Ray White Freshwater. Based in Freshwater.